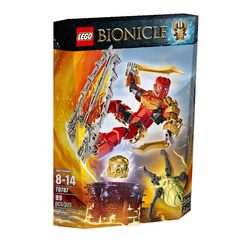 70787 Tahu - Master of Fire is a BIONICLE set released in 2015. This is a description taken from LEGO.com. Please do not modify it. (visit this item's product page) Surf molten lava with Tahu! Heat up the BIONICLE® action with Tahu – Master of Fire! Attach the lava surfboard to the feet of this powerful, posable figure and surf into the volcanic crater in adrenalin mode. Then turn the surfboard into 2 awesome elemental fire blades ready for combat. Activate the bashing battle arm to swipe away the Skull Spider’s attempts to pop off Tahu’s mask and get to the magical Golden Mask first. Surf the lava in adrenalin mode! Resist the Skull Spider’sattempts to pop off Tahu’s mask! Combine with 70783 LEGO® BIONICLE® Protector of Fire using building instructions available at LEGO.com/BIONICLE to power up for ultra elemental battle! Facts about "70787 Tahu - Master of Fire"
This page was last edited on 12 January 2016, at 21:21.